You guys, March about killed me! It was crazy times. I went to the wedding of a dear friend down at the tip of Texas in McAllen, had my first craft show, participated in and volunteered for a big Etsy.com event at the interactive portion of SXSW, a new friend came and stayed for a week, I was covering the SXSW music portion for Seattle’s Another Rainy Saturday and my hub’s sassy and awesome mini-sized MeeMaw (aka Wanda) passed away. And those are just the big things. It’s been a long and tumultuous month, and I’m tired. The craft show didn’t turn out as well as I’d hoped, but it went about as I expected. 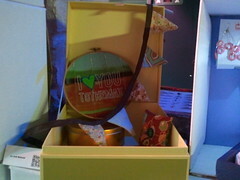 It was good experience for a first time seller, and I got a lot of support from other handmade mavens at the show. Everyone was so kind! SXSW was amazing, sweaty, tiresome and a lot of work. I’m so glad I went for three days, and saw upwards of 20 bands, but I am just as equally glad that it’s over! Some favorites of mine were Jaill, Sunglasses, D. Black, Resplendar, Dan Deacon and We Are ENFANT TERRIBLE. My first day’s account of the events are up already on Another Rainy Saturday. I feel like there is so much going on! I haven’t had time to check my RSS blog feeds, or write blog posts, or even unload my craft show gear. BLARGHHH. What do you guys do when things tend to be a whirlwind of craziness? How do you keep from going mad? 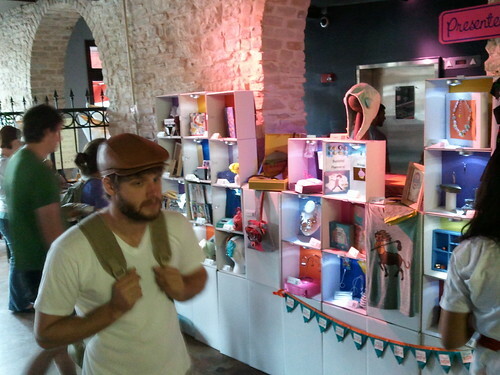 PS: Those pics are of our Wall of Wow display for Etsy.com at SXSW. 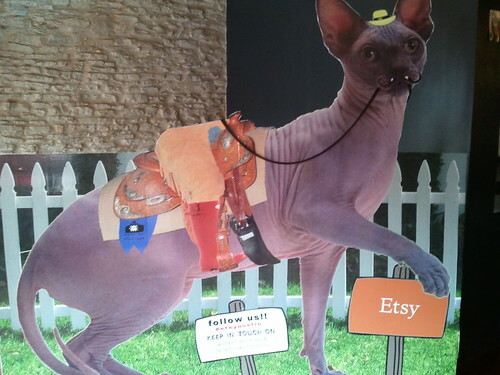 You could ride Babsy the cat!